You may have heard of Jane Goodall and her dedicated work with chimpanzees. You may also have come across the names of the late Dian Fossey and Biruté Galdikas, who supported research efforts around endangered gorillas and the orangutan, respectively. But have you ever wondered why they became well known, or what it might take to live a life in the jungle? Primates‘s graphic novel format makes their stories accessible. Readers will learn, for example, how Jane’s observations led to the need to redefine the term “man,” how Dian got right into ‘the scoop of things’ through her dung swirling technique, and about the accident that left Biruté’s bottom looking like a “burnt marshmallow.” They’ll also find out how all three women’s work stemmed from that of archaeologist and naturalist Dr. Louis Leakey. 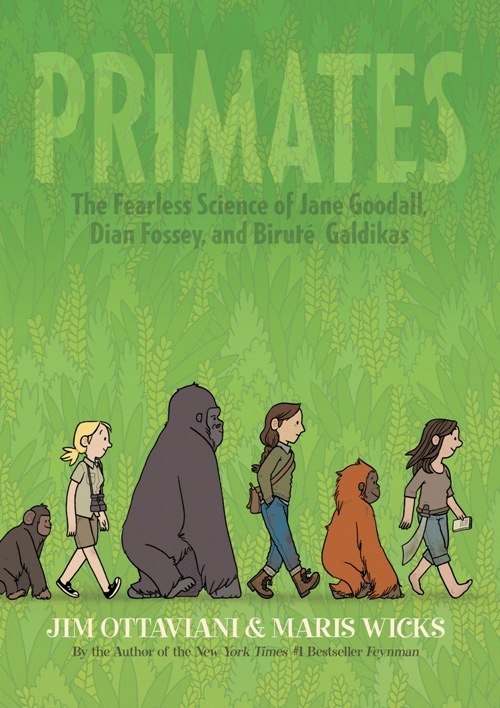 This graphic novel offers a somewhat fictionalized telling of the trials and tribulations of the three female primatologists’ lives and their groundbreaking work as they observed the lives of chimpanzees, gorillas and orangutans. While gender gaps are being addressed, it is still rare to come across literary material that showcase the notable work of female role models. Past the appeal of the book jacket and the beautiful illustrations, what attracted me to this graphic novel was the focus on three powerful and dedicated women who made a difference in the history of science. The addition of a real photo of the three primatologists standing together as if they are in discussion, as well as a list of resources at the back of the book, encourages further curiosity about the lives of these scientists. The book can also be a route to building awareness about primates’ increasingly endangered habitats, and to furthering the fight for the preservation of what remains today. See other reviews: NY Times Book Review, NY Journal of Books Review and Finding Neverland. Read the interview between staff at School Library Journal and author Jim Ottaviani. The basics of the development of the atomic bomb are familiar to most. The details, less so. Bomb is full of scientific, historical, and political explanations that will make the circumstances surrounding the first atomic bombs much clearer. This may well intrigue those who enjoy reading about particle physics or political history. Here’s why you should check out Bomb even if you don’t: Sheinkin does a fantastic job of making something you should understand into something that you actually care about. The story begins years after the Second World War, with Harry Gold, one of the American men drafted as a spy for the Soviet Union, agreeing to confess his crimes. The unlikeliness of this scenario — Gold is a nervous chemist who still lives with his father and brother — sets up the project well. All the way through, Sheinkin pulls in details and anecdotes that help the events described, and the people involved, come across as real, memorable, and eminently shareable. Read the book yourself, and you will be dropping bits and pieces into conversation. Pass it on to a student, and they’ll come back looking for more about Moe Berg, Robert Oppenheimer, and Richard Feynman. 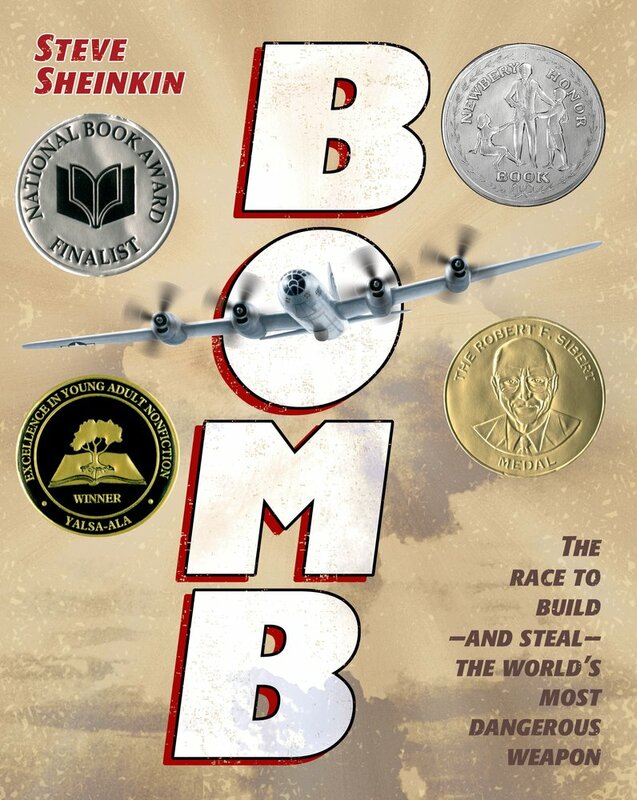 Bomb is a truly fascinating account of the scientific and political pursuit of the first atomic bomb, rounded off with a sobering look at what the existence of the bomb means we are able to do to one another. With incredible research, skilled narrative, and an emphasis on characterisation that puts plenty of fiction to shame, Sheinkin tells history in a way that will keep even the most story-oriented reader engaged. Readers find books in all sorts of ways. Sometimes they’ll make use of the sort of resources we listed last week, sometimes they’ll ask someone they trust — a friend, parent, teacher or librarian — and sometimes they’ll just go browsing. Each reader develops a sense of what characteristics tend to mark the sort of books they’ll like, including title style, plot features, protagonist characteristics, setting, format, and even features of the physical book, such as colours, fonts and types of images used on the covers. I think it would be fascinating to have students browse the library, pick out five books that appeal to them, and then have them sit down and look for the common features that they’ve learned intuitively to watch for. In the meantime, I thought I’d share ten new(-ish — 2012/2013 releases) books I’m looking forward to reading and why. I loved the Mysterious Benedict Society trilogy, in part because I was so impressed by Stewart’s ability to tie the three together effectively while making each story distinct and enjoyable on its own, and in part because I liked the characters so much. Each is unique, grows believably through the course of the trilogy, and relatable in their mixes of strengths and weaknesses. While Reynie, Kate, Constance and Sticky won’t be in this prequel, I’m hoping to find Nicholas Benedict similarly developed as a dynamic, memorable character. Though billed as Asgedom’s own story, Of Beetles and Angels focuses much of its attention on the stories of others. In particular, Asgedom speaks for his brother Tewolde, killed by a drunk driver in his final year of high school, and for his father Haileab, reduced from cherished country doctor in Africa to disabled dependent in the US before being killed by another drunk driver. Although he speaks honestly of both the strengths and the weaknesses of these men, and of the difficult circumstances that his family and other refugee families faced, Asgedom’s memoir is clearly intended above all to be inspirational. The beetle/angel motif runs through the whole of the work, emphasising one central message: it is painful to be treated like a beetle, but every person can make the choice to treat others like angels, and thereby live a meaningful and satisfying life. What the reader sees of Asgedom’s journey is, if anything, the gradual discovery of this empowering truth as he encounters again and again the impact of his father’s and brother’s commitment to honouring others. Despite its weighty subject matter, Of Beetles and Angels frequently feels a bit idealised. While this (as well as some of their father’s unsettling threats) might be appropriately ascribed to the family’s cultural background, teens may grow impatient with the almost impossibly high standards Asgedom takes for granted. That said, the memoir has a lot to offer readers—perhaps it could be recommended alongside other resources focused on the experiences of refugees immigrating from Sudan to North America. Read the Kirkus review or visit Mawi’s blog.